The singer danced to his new music as part of the off-Broadway play Fuerza Bruta: Look Up. Fuerza Bruta is the fast-paced and acrobatic play in which the audience stands as performers dance and jump around on the walls, onstage and on the floor with the crowd. Usher worked as its lead "Running Man", beginning the show on a treadmill, bursting though paper-made walls as his tune Climax played at the invite-only event. There was also a plastic pool suspended above the crowd, where dancers moved and splashed around to songs, including one with lyrics like "It's raining inside your bed". 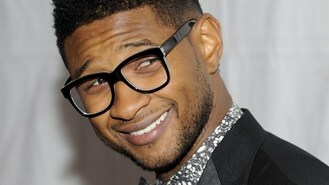 Usher will release his seventh album, Looking for Myself, on June 12.